I love a long journey by car or rail, but not by airplane. Back in my flight instructing days, I used to love to take a Cessna 182 on a long jaunt, but these days the flying I do means sitting in the cheap seats in the back of a gigantic jet and suffering the various indignities of security checks, long lines and tightly packed quarters. Hence my 1000 mile rule: If the trip is less than that distance, I’ll drive it or look for a rail connection. My recent trip back to the Midwest reminded me how much I enjoy seeing the scenery at my own pace and having plenty of time to think. One of the things I thought about was how to extract maximum value from spacecraft. A decade or so ago, JPL’s James Lesh explained to me how the signal from a distant probe passing behind a planet would be affected by that planet’s atmosphere. An elementary way to do atmospheric science! I’ve mused ever since about how to do complicated things with existing resources and how to put technology in the right place for bonus information returns. All that led to thoughts about our prime astrobiology targets in the outer system: Europa and Enceladus. Earlier this month I wrote about Lee Billings’ Aeon Magazine essay Onward to Europa, in which he speculated about the the possibility of exploring what is beneath the Europan crust. A mission like this could be done without actually descending to the surface and penetrating the ice. Billings noted that the Hubble Space Telescope has detected water vapor, estimated at about 7000 kg of water per second, being blown into space from the surface. Europa’s high-radiation environment is challenging even for a robotic lander, but maybe we could fly through the Europan plume to sample the moon’s chemistry and possibly even detect signs of biological activity. 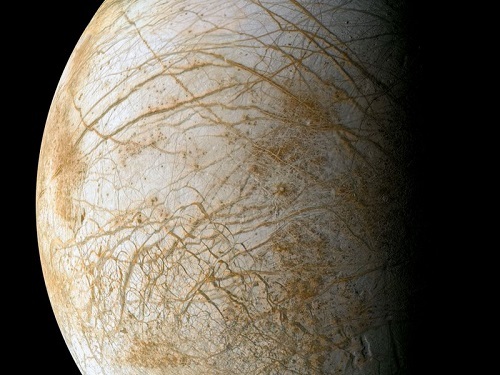 The essay Ship of Dreams in Astrobiology Magazine speculates on the proposed Europa Clipper mission flying through the plumes, but budget issues could make the $2.1 billion Clipper too expensive. Image: A prime target for astrobiology, Europa (as imaged here by the Galileo spacecraft) is the subject of multiple mission concepts. Credit: NASA/JPL/Ted Stryk. Similar ideas have surfaced about Enceladus, with an eye toward flying a complicated mission on a tight budget indeed. Consider the Life Investigation for Enceladus mission concept, championed by Peter Tsou (Sample Exploration Systems). I read more about this one in an essay by Andrew LePage on his Drew ex machina website. LePage, a physicist and writer who serves as senior project scientist for Visidyne Inc. in Boston, notes that the LIFE mission would use an aerogel collector like the one NASA used in the Stardust sample return mission to return cometary dust in 2006. Some concepts also call for sample return from Saturn’s E-ring, thought to be made up of particles originally from Enceladus’ geysers. All this came into the public eye last summer at the Low-Cost Planetary Missions Conference (LCPM-10) at Caltech, where Tsou laid out a 15-year mission that would launch in the early 2020s, reaching Saturn in May of 2030 after a series of gravity assists past Venus and the Earth. LIFE would use close passes by Titan to alter its orbit, allowing multiple low-speed approaches through the Enceladus geyser region above the moon’s south pole. At speeds slower than Stardust’s encounter with Comet Wild 2, the Enceladan material should be better preserved when captured. LIFE would then use Titan for further gravity assists followed by a return to Earth in 2036. I love the concept as much as I love extracting atmospheric science from communications signals. The cost excluding launch might be kept as low as $425 million. The potential gain is high. LePage likes it, too, and goes on to suggest not just improvements to the Enceladus idea, but a different sample return mission that would bring back materials from both Europa and Io. The mission could launch as early as 2021, with rendezvous with Jupiter in October of 2025. LePage lays out the basics: An elongated orbit to avoid the worst of Jupiter’s radiation belts, gravity assists from Europa, Ganymede and Callisto, multiple low-velocity encounters with the Europan polar plumes and gathering of plume materials with the aerogel collector. While a lot more work is required to flesh out the details of a Europa-Io sample return mission (especially more information on the nature of Europa’s purported plumes), at first blush it does appear to be feasible using the same hardware proposed for the LIFE mission to Enceladus employing readily available launch vehicles. This proposed mission also nicely complements the investigations of the LIFE mission by returning samples from yet another set of plumes on a potentially life-bearing moon with the added bonus of sampling volcanic material from a second target of keen interest to planetary scientists – Io, the solar system’s most volcanically active world. For minimal additional costs (i.e. a second spacecraft and launch vehicle along with the incremental cost increase of running two missions in parallel), this scientifically interesting mission could be flown in parallel with LIFE and greatly increase its total science return. And it could probably do so within the Administration’s proposed billion dollar price cap for a Europa mission. Given that we’re now dealing with budget proposals that confine a NASA Europa mission to under a billion dollars, the sample return mission to Europa even without the Io component offers a profoundly interesting science return, and I like the synergies with the more fully developed LIFE concept. In any case, we have two highly intriguing astrobiology targets that are conveniently venting material into nearby space, making landing on the surface — much less trying to penetrate fissures or drill through thick ice — unnecessary at this stage of our investigations. What we learn from such missions could well determine how we press ahead with later, more complex missions that would demand operations on or below the ice. I would like to see an on-board detector system to analyse the materials collected. The aerogel captures the material and it is rotated inside a protected area for detection with lasers and other instruments. With that process the craft could orbit around Jupiter/Saturn doing other studies as well. Those awfully tight budget constraints force engineers and scientists at NASA to imagine marvels of synergies and cost-saving strategies. If only we had used those concepts while the overall budget was manyfold higher, we might have had already an answer to the Great Question (“did life arise elsewhere than on Earth?”): not 42, but either “yes”, or “probably it didn’t arise twice in this solar system”. Agreed – because there is much that can go wrong on the return leg, minimising the chance of losing the data on such a hard-won prize should be a high priority. My feeling on the whole proposal of going to Europa as a target for searching for organic life I think would be considered to be a fool’s errand. I think in terms of what is more reasonable is to target the Saturnian system and go to Titan. This particular moon already possesses a rather dense atmosphere, not to mention freely available hydrocarbons of all different types which I presume would be more reasonable building blocks than the radiation so moon such as Europa. We can’t say with any certainty that the moon Europa would necessarily have an extensive are very deep ocean underneath the ice that would make it a target for life. Additionally above all else Titan appears to be geographically speaking for more interesting and to potential place to explore with many more possible means of performing the exploration. 2030. Mmmm… That sounds like too long a wait for results, without even digging on the moon’s soil. Maybe I’m missing something, but what’s the difficulty of building a lab on board to analyse the materials? Isn’t Curiosity’s lab technology good enough for that? A sample return mission presumably allows the probe to be (relatively) simple and inexpensive. The samples could be subjected to much more extensive and sophisticated analysis here on Earth than would be possible in space, and some of them saved for when even more advanced forms of analysis are available in the future. This is a brilliant mission concept. First of all, I want to thank Paul for presenting my Europa sample-return concept to a wider audience. Secondly, I appreciate all the discussion this concept has been generating and wish to address one of the themes that seems to come up frequently in the comments here: Why don’t we just analyze the samples on board the spacecraft? The answer is simple: Costs. The premise of this proposal is to perform a meaningful Europa mission for less than $1 billion dollars. Assuming that the cost estimates by Peter Tsou et al. for their proposed LIFE mission to Enceladus (whose hardware my proposal employs) are reasonably accurate, this bare-bones Europa sample return concept fits the bill with margin to spare for slightly enhanced capabilities (e.g. additional remote sensing instruments) and inevitable cost overruns. Adding too many additional capabilities to this mission like performing in situ analysis of the collected samples quickly increases the complexity and cost of the mission to the point where it will exceed the billion dollar cost cap. Yes, Curiosity has remarkable in situ analysis capabilities but that was a $2.5 billion project that, despite its advanced instrumentation, can not match the sample analysis capabilities of an Earth-bound laboratory. An argument has also been presented that the risks of the final leg of the mission (i.e. the return to Earth with the sample) are too great and therefor the analysis of the valuable samples should be performed on board. History has shown that this is simply not true. The launch and sample collection phases of sample return missions attempted over the last 45 years are demonstrably much riskier phases of such missions. There has never been a sample return mission that has been lost on its return leg (although there has been a close call or two). The risks of a mission-ending loss of a key in-situ analysis instrument are much greater than losing the sample on its way home. In any case, thanks for all the comments! A mission to Titan could pass by Jupiter for gravity assist and sample ejecta from Europa on the way. Jupiter is the crossroad of the Solar system, every mission to the outer system is a quick flyby of Jupiter too. I think we should aim further and learn about the Jupiter system on the fly. in a manner that funnels the particles into catchment areas where the L-O-C’s are could allow particles to be examined more closely for organic signatures and other properties. There may not be greater risks as you say in the final leg but there is a time element, it could take another 5 to 10 years to get the sample back! Well, just to be retentive, the Genesis solar particle collector did not have the smoothest of Earth landings…. Ever see this Europa Clipper concept from 1997? Some more recent past Europa probe ideas…. There are three problems with your suggestion of a Europa sample return being performed using a flyby of Europa en route to Saturn. First, the encounter velocity would be on the order of 10 km/s or much higher (depending on the details of the trajectory). Peter Tsou and his team purposely designed their mission to keep the encounter velocity with Enceladus down to the 3.7 to 4.0 km/s range (which I also adopt for Europa) to minimize the damage to the collected samples. The order of magnitude increase in kinetic energy during capture could destroy any samples. Second, launch windows with good opportunities to reach Saturn via Jupiter are uncommon and the most recent set of available windows will close after the late 2010s. No good low-energy Jupiter-Saturn trajectories will be available until the 2030s. This is why the most recent LIFE proposals to Enceladus have used various combinations of Venus and/or Earth gravity assist trajectories in their mission planning for a launch in the early 2020s. Finally, there might not be many or any good launch opportunities that allow a close Europa flyby followed by a transit to Saturn (and if there are, they might not meet the needs of the Saturn mission). If you are going to do this sort of Europa sample return mission, its best done as a dedicated mission to Jupiter. I am not denying that there can be some very clever analyses that can be performed by the spacecraft. But they add to the complexity and ultimately the costs of the mission which is the primary driver for the design of this mission. And no matter how clever any on-board analyses are, they can never compare to what can be done in a laboratory back on the Earth. As for the time, the 2.8-year return trip to Earth after one year orbiting Jupiter is relatively short (and operationally simple) compared to the total 9.2 year mission time. That is a very short return time, what would the re-entry velocity be? >10km/s I bet, which needs heavy shielding. I don’t suggest sample return, but a flyby sample collection and analysis onboard. A sample return takes too many decades, and suffer from high risk of failure upon return. First, Europa has at its maximum a somewhat similar speed from the Sun as had the Voyagers when they passed by Jupiter (26 km/s). The collector’s speed relative to the sample they take need not be very high. Sampling both Europa and Enceladus on the same flyby is likely unrealistic. But most new missions with an outer planetary flyby should sample one of them and then be sling shot to secondary purposes, like New Horizons. Second, I don’t understand how that could be. Jupiter makes an orbit about every 11 years. Saturn takes 29 years. So every 15 or so years they’re obviously optimally lined up again for gravity sling. Inbetween, Jupiter is optimal for Uranus, Neptune and even some Centaur asteroid. And for each finally a KBO. Third, Europa orbits Jupiter every 3.5 days. 0.01 years, so one could always time an optimal sling shot around Jupiter with a close flyby of Europa. Michael, I am not discounting your valid points about the need for shielding around Europa. However, one of the beauties of cubesats or something even smaller is that they are many and disposable without crippling the mission should some of them fail. Have them last just long enough to do a particular task – especially if it is dangerous and dirty – and then we don’t care what happens to them after that. Though I realize we should not be quite so casual about even disposable probes when it comes to essentially abandoning them on an alien world we want to investigate for possible native life forms. On the other hand, either we attempt to explore Europa or we fret about making a mess and we end up staying away and learning nothing new. As we have seen already, the Universe long ago did not worry about such things by having surface material transfer from Mars to Earth via big impacts and I am sure vice versa. The Sol system may already be “contaminated” with the remains of organisms inadvertently launched from one world to another for eons. First, any flyby of Europa from an interplanetary approach trajectory will have an absolute minimum encounter velocity of at least 6 km/s and those trajectories that are required to continue on to planets further out with reasonable transit times (e.g. to Saturn, Uranus, Neptune, etc.) will have encounter velocities on the order of 10 km/s or MUCH higher – far too high for any sample to survive intact for subsequent analysis – onboard or otherwise. This is why the proposed LIFE mission (as well as my proposal for Europa) strive to minimize the encounter velocity to 4 km/s or less which can only be done from an orbit around Saturn or Jupiter, respectively. Second, the time between successive alignments between planets, P, with periods P1 and P2 is calculated by 1/P = 1/P1 – 1/P2. In the case of Jupiter (P1 = 11.9 years) and Saturn (P2 = 29.4 years) yields 20.0 years between successive alignments. The favorable launch windows (in terms of launch energy and time of flight) for EJS trajectories of the late 2010s won’t repeat themselves until the late 2030s with less favorable windows (with a trajectory “over the shoulder” of Jupiter, as it were, back across the solar system to Saturn like the trajectory of Pioneer 11) being available starting around 2030. There are just no favorable EJS trajectories available during the 2020s. It is also HIGHLY unlikely that any mission dedicated to an investigation of Saturn or beyond will carry tens to hundreds of kg of extra weight to support a secondary objective of a Europa sample collect. A dedicated mission to Europa is the only realistic solution. Finally, third, the issue is not how frequently Europa will be in any particular position in its orbit around Jupiter, the issue is that whether any trajectory that includes a close encounter with Europa can support reaching a desired objective beyond Jupiter. This was the case with the Voyager mission to Saturn in 1980 and 1981 as mentioned in Paul’s post in Centauri Dreams about Titan on Thursday. At that time there were no trajectories available that allowed a close encounter with Titan and a subsequent encounter with Uranus. It was either one or the other and the same situation applies with a Europa flyby en route to a target further out. I highly recommend that you read my original essay and its references (provided by the links above) so that you understand the rationale behind the mission designs. The reentry velocity for my particular choice of return trajectory from Jupiter is 18 km/s which is within the range velocities in Peter Tsou’s original LIFE proposal. While it is certainly higher than the entry velocity of the Stardust mission (12.9 km/s) it is much lower than the entry velocity of the Galileo probe (47.8 km/s) and is well within current engineering capabilities. I would recommend that you read my original essay and the references related to the LIFE proposal via the links provided above which covers this and other engineering issues in detail. How are these cost estimates produced? Is there an online database one could use to estimate costs of other hypothetical missions we could think of? I like the plan, it is simple and workable although the amount of science of the Planet would be less than if the probe stayed in orbit. There is also the chance that it would find nothing, that is an expensive risk to take. But having said that finding life in Europa would be a scientific achievement without parallel. I readily admit that more needs to be learned about the nature of Europa’s polar plume before this mission could be properly designed (in fact at this stage, the existence of that plume needs to be confirmed independently for starters). It may turn out that the density of solid material in the plume is so small (especially compared to the plumes of Enceladus) that catching solid particle is not practical in which case some sort of appropriate collector to capture plume gases might prove to be scientifically useful (just as some early versions of the LIFE proposal included collections of gases from Titan’s atmosphere – an option that was late cut to save on costs). Either way, I have hedged my bets by including a collection of volcanic plume material from Io (which certainly are known to exist at high altitudes with high particle densities) and an option to sample Jupiter’s Gossamer Ring indirectly sampling Amalthea in the process (just as some early versions of LIFE included E-ring sampling) so that some scientifically useful material is returned in addition to any remote sensing data. I wouldn’t place any bets that this sort of sample return would find any evidence for life on Europa but the scientific return could be substantial given the costs and the risks. The Abdus Salam International Centre for Theoretical Physics, Trieste, Italy. our notation k is a constant of proportionality; it is the product of a few factors, which we need not specify here; fe denotes the fraction of planets, or satellites, where eukaryogenesis occurs. Our conjecture motivates the search in our solar system, particularly in Europa, for a hint that the key factor in the evolutionary pathway that leads to intelligence, fe, is non-vanishing in at least one extraterrestrial environment. In Arthur C Clarke’s 2001 A Space Odyssey, the supercomputer HAL issues a last instruction to the Discovery crew ALL THESE WORLDS ARE YOURS EXCEPT EUROPA ATTEMPT NO LANDING THERE. Now, NASA scientists have a better idea: Powerful radio signals that Jupiter generates could be used to help researchers scan its giant moons for oceans that could be home to extraterrestrial life. Jupiter, the largest planet in the Solar System, possesses 67 known moons, including three giant icy moons that might possess liquid oceans underneath their frozen surfaces. Astrobiologists want to investigate Europa, Ganymede and Callisto for extraterrestrial life, as there is life virtually wherever there is liquid water on Earth. The strategy that Romero-Wolf and his colleagues developed involves placing a spacecraft between Jupiter and one of its icy moons. The probe would then monitor decametric emissions from Jupiter as well as echoes of those signals reflected off the icy moon. By comparing the signals from Jupiter with the echoes from its moon, the researchers can determine the thickness of the moon’s icy shell and the depth of its ocean. This might even work for bringing back bits of Mars! What lies beneath the cracked, thick ice on the surface of Europa? NASA is hoping to fly a mission to the Jupiter moon in the coming years to see if it is indeed a promising site for life. If this concept is approved in the budget, think of the mission as a recce: NASA will either orbit the moon, or do several flybys on it, to scout the surface for science and potential landing sites. NASA just announced its desire to have science instruments proposed for the mission. Of the submitted list, 20 proposals will be selected in a year’s time, when selectees will have $25 million to do a more advanced concept study. For many space enthusiasts, a new mission to Jupiter’s ocean moon Europa is high up on their wish lists. Today, NASA announced that they are seeking proposals for science instruments for just such a mission, bringing it one step closer to reality. NASA wants science instruments which would be compatible with a spacecraft which would either orbit the moon or make multiple flybys, such as the Europa Clipper. A lander or even probe into the ocean itself would still be father in the future. The mission would be part of the National Resource Council’s (NRC) Planetary Decadal Survey. Initially, 20 proposals will be accepted in April 2015. About $25 million will then be awarded for the selectees to further advance instrument development for this stage of the process, Phase A. From these, 8 instruments will be chosen to actually be built. Current data does not provide sufficient information to identify landing sites and design a landing system capable of safely reaching the surface. In the AO, NASA included a reconnaissance goal to characterize scientifically compelling sites, as well as hazards, for a potential future landed mission to Europa. While interest in a mission to Jupiter’s icy, and potentially habitable, moon Europa is growing, funding for such a mission has been lacking in NASA’s budget requests. Casey Dreier argues that a Europa mission could, in fact, solve several of the problems NASA is facing today. In Arthur C Clarke’s 2001 A Space Odyssey, the supercomputer HAL issues a last instruction to the Discovery crew ALL THESE WORLDS ARE YOURS EXCEPT EUROPA ATTEMPT NO LANDING THERE. What might we find? To prove that life exists, or did at one time, what signs should we be looking for? Possible signs of alien life might include a wide range of features. For example, cells walls or membranes made of simple carbohydrates encapsulate the most successful life-forms on our planet: bacteria. Fatty acids-chains of carbons, hydrogens and oxygens-are diagnostic of biosynthetic processes here on Earth. Certain proteins, such as DNA, can only arise from active biological processes. All of these processes and structures all have something in common, though: they use energy to renew themselves. The authors of a paper released in Astrobiology titled, “The Fuel Cell Model of Abiogenesis: A New Approach to Origin-of-Life Simulations,” suggest that rather than focusing exclusively on the structure of life, we should also be looking for the primary process of life: energy transport. To prove their point, the authors built miniature metabolic fuel cells out of elements that would have been available to life as it labored to evolve on Earth. At their most basic, fuel cells systems that convert hydrogen and oxygen into water, and in the process, release energy. WASHINGTON — Jupiter’s moon Europa doesn’t look like a particularly inviting place for life to thrive; the icy satellite is nearly 500 million miles (800 million kilometers) from the sun, on average. But beneath its icy crust lies a liquid ocean with more water than Earth contains. This ocean is shielded from harmful radiation, making Europa one of the solar system’s best bets to host alien life. That’s one of the reasons Europa is so alluring to scientists. It has all the elements thought to be key for the origin of life: water, energy, and organic chemicals, the carbon-containing building blocks of life, scientists said at an event called “The Lure of Europa,” held here last month. “All the ingredients are there to make us think Europa is the next place to go,” NASA Chief Scientist Ellen Stofan said at the event, which was organized by the Planetary Society, a nonprofit organization headed by scientist and TV host Bill Nye. The huge plumes of water vapor erupting from Jupiter’s ice-covered moon Europa seem to have vanished, and scientists aren’t sure why. In December 2013, researchers using NASA’s Hubble Space Telescope announced that they had spotted evidence of geysers blasting into space from Europa’s south polar region. The discovery sparked a great deal of excitement among space scientists, as it suggested that a robotic flyby probe might be able to sample Europa’s subsurface ocean of liquid water without even touching down. However, follow-up Hubble observations in January and February of this year showed no signs of the plumes, which were estimated to reach about 125 miles (200 kilometers) into space. “Since ’tis certain that Earth and Jupiter have their Water and Clouds, there is no reason why the other Planets should be without them. I can’t say that they are exactly of the same nature with our Water; but that they should be liquid their use requires, as their beauty does that they be clear. This Water of ours, in Jupiter or Saturn, would be frozen up instantly by reason of the vast distance of the Sun. Every Planet therefore must have its own Waters of such a temper not liable to Frost”. In his seminal book ‘Cosmotheoros’, 17th-century Dutch mathematician Christiaan Huygens speculated about the possible habitability of other planets in the Cosmos, which he viewed as being not less capable than the Earth in hosting their own complex forms of life. Yet, even though the scientific exploration of the Universe hasn’t discovered the existence of any extraterrestrial life to date, it has nevertheless helped to reveal a Universe that is much more dynamic, complex and fascinating than what was ever previously thought. A series of spectacular discoveries in the last 50 years of entire terrestrial ecosystems thriving on places that where previously thought to be too hostile to life, have similarly transformed our concept of habitability and the possible environments where life could take hold. The latest findings of microbial life flourishing in the extreme environment of subglacial Lake Whillans in Antarctica that were detailed in the first part of this article, are further hinting at the possibility of life possibly existing in a similar fashion as well in the mysterious, underground alien waters of Europa. Jupiter’s moon Europa is a fascinating little world, but particularly so for one reason – water. It’s deep alien ocean underneath the surface ice is reminiscent of our own planet, and since our oceans and seas are teeming with life, even beneath the ice at the poles, could Europa’s ocean also harbor life of some kind? Now, another discovery shows that Europa may be similar to Earth in yet another way, and one that could bolster the chances of life even more – plate tectonics. The new results were just published in Nature Geoscience on Sep. 7, 2014. The discovery was made by Simon Kattenhorn, a geologist previously at the University of Idaho in Moscow, and Louise Prockter, a planetary scientist at the Johns Hopkins Applied Physics Laboratory in Laurel, Maryland, after looking through photographs from the Galileo spacecraft, which orbited Jupiter from 1995 to 2003. The separate images were treated like pieces of a jigsaw puzzle. Since the surface is covered with ridges, bands and cracks, the scientists could trace back how the broken-up pieces used to fit together, something like continental drift on Earth. “When we moved all the pieces back together, there was a big hole in the reconstruction, a sort of blank space,” says Kattenhorn. Missing pieces, the scientists concluded, probably sank downward, just like tectonic plates can override each other on Earth. All of this is important, since organic material, also just found on Europa’s surface for the first time, and nutrients could then have a way of making it down below the surface and into the water deep below. This of course has a direct bearing on the possibility of life in Europa’s ocean. Minerals necessary for life are likely present on the rocky ocean bottom as well since the rocky mantle is thought to be in direct contact with the ocean water just like on Earth. NASA’s Jet Propulsion Laboratory in Pasadena, California, has chosen proposals from 10 universities to study CubeSat concepts that could enhance a Europa mission concept currently under study by NASA. The CubeSat concepts will be incorporated into a JPL study describing how small probes could be carried as auxiliary payloads. The CubeSats would then be released in the Jovian system to make measurements and enhance our understanding of Jupiter’s moon Europa. CubeSats are small, lightweight and low-cost satellites, often only inches on a side. With support from NASA, JPL is working to include small spacecraft on deep space exploration missions to complement primary spacecraft. The conceptual Europa mission, called Europa Clipper, would conduct detailed reconnaissance of the icy moon and investigate whether it could harbor conditions suitable for life. Awardees will receive up to $25,000 each to develop their CubeSat concepts for inclusion in the study, which will be completed next summer.